Thought it was about time I got on with writing some notes on my week away aboard Swan Reflection 2. As those who have read my tales before will know, we have hired this boat on a number of occasions previously when it was with Swancraft. When we heard that they were sadly closing their hire business we decided to follow the boat up to Richardson's and cruise the northern rivers this year. Having written a number of these tales I am going to try something a little different. Instead of writing up my holiday day by day, I am going to write posts centred around particular themes so that it also becomes something of a review of the week rather than just where we went and what we did. But let's start with the route we took ... while I can still remember where we went each day! We started this adventure on Friday 17th June and returned the boat on Friday 24th June. We cruised for around three hours each day apart from Tuesday when the weather was particularly fine and we spent longer out and about. Day 5 - Womack Dyke to Horning for lunch, then a cruise on into Wroxham and back to Ranworth Island ... yes that was our other favourite spot as we don't mind paying for the overnight mooring and given how busy some moorings get this is a often a good backup plan. Day 6 - Ranworth Island to Stokesby then back to Acle - we needed water again but also decided to stay here for the rest of the day this time. Day 7 - Acle to Sutton Staithe - we needed to be somewhere close to Stalham for taking the boat back the next morning and arrived just before lunch so were able to moor up on the end of the staithe with a lovely view back up the river. Day 8 - Sutton Staithe to Stalham - a short trip to take the boat back. Departed Sutton around 6.15am in beautiful sunshine and had breakfast once we were moored back up in the boatyard. Day 1 we decided to have lunch at the Wayford Bridge Inn as that's so close to the boatyard. We had enjoyed a splendid meal there back in March and were not disappointed on our return visit. The restaurant area quickly filled up and the atmosphere was very light and friendly - helpful staff but not intrusive. We both had scampi and chips and hubby had the cheesecake for dessert. Reasonable price for good food. Day 2 being moored at Womack Dyke we walked into Ludham and had lunch in the King's Arms. Now this is a strange one. Most times we end up eating in the pub area but not today. The rugby was on the tv and the place was packed. So we were the first to go through into the restaurant area although several other couples followed suit within a short time so we weren't on our own for long. We had very good mushroom omelettes to eat. Our waitress was very nice but ... I always get the feeling that this is much more a local's pub than other places. Great to see somewhere obviously popular and doing good business but I never feel entirely comfortable in there. Still the food and drink were good and Ludham's a nice little village. Day 3 was a stay-on-the-boat day so we had a microwaveable ready meal on board that we had taken with us. Day 4 saw us back at Womack Dyke but this time the weather put paid to our plans to walk into Ludham for lunch. We did finally get up to the village for some shopping when the rain stopped during the afternoon and cooked tea on the boat before the football started! Day 5 was our longer cruising day. Lunch was at the New Inn in Horning where we got moored about 11am without a problem. Lovely scampi and chips again made all the more tasty by being sat outside by the river. There was a lot of demand for the moorings especially from day boats - watching them struggle to know how to handle their little boats was quite amusing at times. 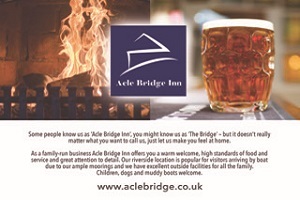 Day 6 saw us make our first venture into the Bridge Inn at Acle. So many people have talked about how good this place is that we thought we must give it a try. We had considered trying the Ferry Inn at Stokesby but the moorings were full so we turned back to Acle as we had intended to moor overnight there anyway. The fish and chips were lovely however the area that we were sat in wasn't very busy and maybe that's why we didn't feel any ambience about the place. Our waitress was a little brusque as well - no chat and it felt as if we were dealt with in a very business-like manner. I tried but couldn't seem to engage her in conversation so ... not top of our list to go back to. Good food, good price but just lacking something it's hard to define. Day 7 we had lunch at the Sutton Staithe Hotel. What a strange little place but clearly very popular. The staff were very friendly and helpful and we enjoyed this last lunch very much - ham, egg and chips for a change. Very tasty and very large portions that we didn't quite finish. So that was the end of our adventure. How would I rank the places we ate at this time? I'm sure that the time of day, and whether you are in a larger group, may influence how you find the atmosphere and overall experience. These are just my thoughts as a couple out on our own. Very interesting, Jean and it throws up the old apple of who goes where, when and whom they meet! Mary-Jane and I have never had anything but excellent courteous service at the Acle Bridge and would rate it higher than you do. In fact on our 10 days North around the Spring Meet it was the best place we ate at! But that's just our personal opinion and you certainly seem to have had an overall enjoyable week! 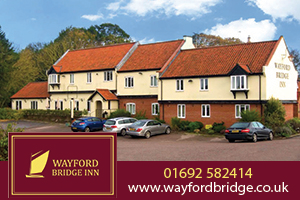 Sounds like you had a lovely time, we've had Sunday lunch at the Wayford and really enjoyed it. Have to ask if Reflection has been kept as good as Swancraft, had them, we're on Reflection1 in August and looking forward to it after being on Rapture the last twice. Given Jim's question above it would seem that this is the time to think about how we fared hiring SR2 from Richardson's. The state of the boat was something we had wondered about given we have hired from Swancraft in the past. Inside the boat was pretty much unchanged. Richardson's have put a new gas cooker in, added some cushions, and I think that they have also changed the steering wheel. The real difference was how the boat looked on the outside - not as shiny and gleaming as it used to but nothing wrong with it. And that was the same for all the Swan boats we saw out during the week. They seem to be hiring well and we kept passing them. Someone in the know about these things commented the same. I won't name him but he regularly sees most of the boats out and about and agreed that they don't shine the way that they used to. It depends how important that is to you and if you had never seen the boats out previously then you probably wouldn't think twice about it. And inside it was absolutely fine. We had a problem with the bilge pump. Called the emergency engineer Monday evening. He talked us through checking a few things and concluded that we could safely switch it off for the night and promised to call on us about 8.20am the next morning. Sure enough, good as his word, he arrived at the appointed hour, changed a switch and we were on our way. We did have a similar problem the next day and the engineer made a second visit but concluded that everything was working fine after we had jiggled a few wires around. We never had any problems with the boat before but in fairness it's another year on and the same might have happened even if we were with Swancraft. The problem was dealt with efficiently and we were not held up at all. So no complaints there. We hadn't ever hired from Richardson's before so this was a new experience. And compared to the other yards that we have used it felt like check-in at a holiday camp. Queue here, go there, report to the hut ... mind you, it certainly worked very efficiently especially when we returned at the end of the week. So yes, we would go back to Richardson's if they had a particular boat that we wanted. Getting out of the yard was interesting. I had to queue and wait for someone on a trial run to attempt to stern-on moor a very old boat without bow thrusters. Again, no complaints really as at least the hirer looked to be getting a comprehensive hand over. And I was happy that all my previous experience helped me to hold SR2 still while we waited to get past. We would still prefer the southern rivers in June - Sunday morning on the Bure was an experience but we knew it would be busy and planned accordingly, avoiding going into Horning or back up the Ant until later in the week. Out of season cruising on the north is without doubt more relaxing so we're not sure what we will do next year given that we can't find anything we want to hire on the southern side at the moment. 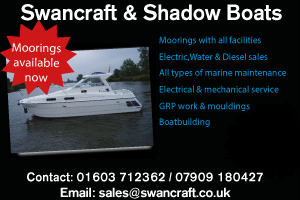 The first boat we hired was Swan Reflection from Swancraft in June 2012 - lovely boat, lovely yard, and maybe nothing else will quite live up to that because it was a celebration of two special occasions that year and everything, even the weather, came together perfectly. Talking of the weather, we had a very mixed bag but it was considerably warmer than the same week over the last couple of years ... so all in all a very good holiday and we were glad to have taken SR2 out again. So in conclusion what were the highlights of this holiday. Well we saw a kingfisher almost as soon as we left the boatyard at Stalham. The Monday evening at Womack Dyke was a beautiful sunset on the longest day of the year, the moon was amazing and was reflected in the river ... and I heard a cuckoo. While moored at Sutton we saw an otter swimming around in the river. Hubby enjoyed his fishing and caught several decent sized bream for the first time. And we ticked three mooring places off our list of those where we hadn't overnighted before - How Hill, Acle and Sutton. I hope you all have a lovely summer and that those of you yet to make your trip to the Broads this year will have a great time. In conclusion here's something that I have put together with some photos and video clips. Enjoy! I have tried to embed the video but got a number of messages about formatting so if it doesn't display please use the link ... unless anyone clever can edit this or paste it in for me! I guess its a tad easier to keep the boat looking shiny in a smaller yard, than turning say a 100 boats round in four to six hours or so. I would say that you are absolutely right Iain. And really for the number of boats going in and out it does seem to be very well organised. I forgot to mention that we only spent £46 on diesel over the week. So we got over £100 back on our fuel deposit. I do think that £150 is a little excessive for the fuel deposit on one week's hire. It would be very interesting to know what the average spend is. Wow! Did you have hubby out pushing you along from the stern ! It could not have been too cold then. In that £150 I think they are assuming you will use the Wroxham pilotage, that would add £12.00 to your costs. I think we did manage to be going with the tide most of the time. And to be honest we cruised at around 4mph, occasionally 5mph but rarely any more. SR2 is such an easy boat to steer. You hardly have to move the wheel and once we were underway and set, we hardly touched the revs either. Hopefully that all helped with the fuel economy. 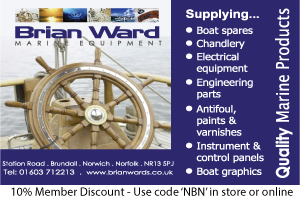 My worse case fuel and pump out (two tanks) was £186 about 3 years ago we had gone over Breydon and back two times over the week journeying from the Southern to Northern Broads and a quick trip across Breydon and back again to show guests that arrived down at the boat. Crossing Breydon is something we haven't done. We were considering hiring from Acle and doing that next year but our plans may have been scuppered. Still I have been checking out next year's tide tables and spied an opportunity mid-May ... will have to see how things work out. I enjoyed your write up Jean and I thought your format worked well. As a Richardsons fan I'm pleased to see they're making the Swan Craft boats work. I agree the service can seem a little impersonal compared to smaller yards but they are excellent at performing the high volume operation of changeover days. I can't believe you've never crossed Breydon! You're missing loads of fun! Having said that, I'm a little surprised you haven't found a boat you like on the south given both Silverline and Brooms have some lovely kit on offer. Mid to late May would give you a chance to meet everyone at the Spring Meet at Salhouse at the beginning of your hols, Jean! 13th/14th May weekend Slack Water Gt Yarmouth is early morning or evening, not too good, John. 20th/21st weekend SW GH is midday, much better! Thanks for your comments Simon. We've never crossed Breydon because we've chosen always to hire on either the south or the north, just for 4 days or one week and stay on that side rather than taking the time to make the crossing. But we've watched enough videos of other people doing it that we feel fairly confident we could get it right and give it a go. The bit about boating that still makes me the most nervous is crossing wide open water - Barton Broad is gradually becoming more enjoyable so perhaps I'll be ready for Breydon next year! I am being a little picky about boats to be honest. The one thing we can't compromise on is the position of the bed - hubby is very tall so it has to be a walk round bed or at least one where there is space at the bottom to hang your feet off. A bed between two walls or with the headboard in the middle of the room, will not work for us. That alone rules out a good number of boats. 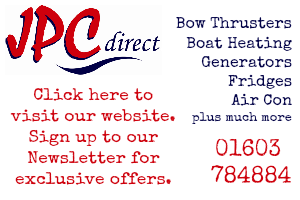 Being only two of us aboard we like to have bow thrusters as well - so they're the two main criteria. I have looked at Broom's Captain boat a number of times but we haven't tried sleeping in the bow yet ... and they are more expensive to hire. Silverline have some older centre cockpit boats but not all the reviews are very complimentary, especially about the struggle to get the roof back. The newer boats from Silverline all seem to be the much larger size so ... I've also checked out Pacific Boats. 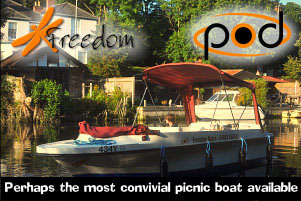 Plus we got in touch with Freedom Boats. Andy was great and came back to us very quickly but agreed that the beds on their boats would probably not be in ideal positions. Very happy to hear any recommendations though. Silverline will have a new two berth boat for 2017. Oh now that is very good news Trambo. I must seek it out. A great yard, I would highly recommend, not the cheapest accepted but you certainly get the quality. I've sent them an email so will be interested to see what I hear back. Please let us know when you get a reply. 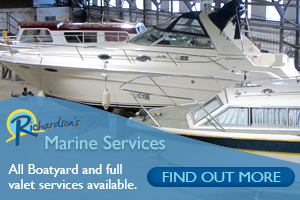 I agree a great yard, well turned out boats and friendly service.